Productivity apps, especially note taking apps, are the new craze sweeping the Mac universe. Scrawl is one of the competitors for you time and money. How does this very simple, elegant, and iCloud compatible app stand out in the crowded marketplace? 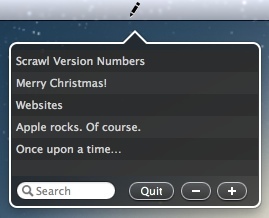 The first thing you will notice about Scrawl is how minuscule it makes itself on your Mac. The only way you know it is currently activated is by looking for the pencil icon located in your Menu Bar. There is no limit to the number of saved notes you can have or their length. 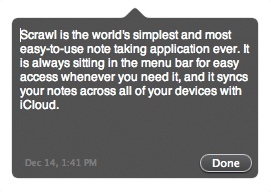 As new notes are created they will automatically save and sync with iCloud. This is a perfect solution for anyone with more than a single Mac. Upon a series of notes being created the user can simply click and drag the note in question up or down the list to improve its visibility and importance. Deletion of saved notes is also as easy as selecting, then clicking the Minus button. Editing is a breeze. Double click any previously created note and start editing the content. You will also notice on the edit screen a date and time is present that indicates the last update made to a specific note. The app also has a valuable search bar located within that allows users to search for any word or phrase within any of the created notes. The one limitation with regard to editing or adding new notes is that not all content is created equally. It is important to note that this app will only work with plain text based content and will not retain any text formatting such as bold, italic or underline font preferences upon being pasted into a note. There are also no formatting options or different fonts available when inputting text from the keyboard. In comparison with Apple’s Stickies app that comes installed with the Mac OS, this lack of formatting is a limitation. The Stickies app does allow for retention of formatting and the inclusion of graphics, audio, and video content. Whilst Scrawl does not promote itself as being able to perform any of these functions it is important to compare current offerings. Stickies in contrast does not offer iCloud compatibility. Overall, the app performs superbly and consumes very few resources. Anyone looking for a simple and easy to use note taking app, with the ability to span multiple Macs, will not be disappointed with Scrawl. With an iOS app currently in development and on track for a Spring 2012 release the integration with iCloud will only provide more everyday usefulness to new and existing users. Therefore, I am awarding this Mac App a MyMac.com review rating of 8 out of a possible 10.